The holiday season is upon us, and 2016 is coming to an end. About time to take a look at the past couple of months, and reflect on our achievements. 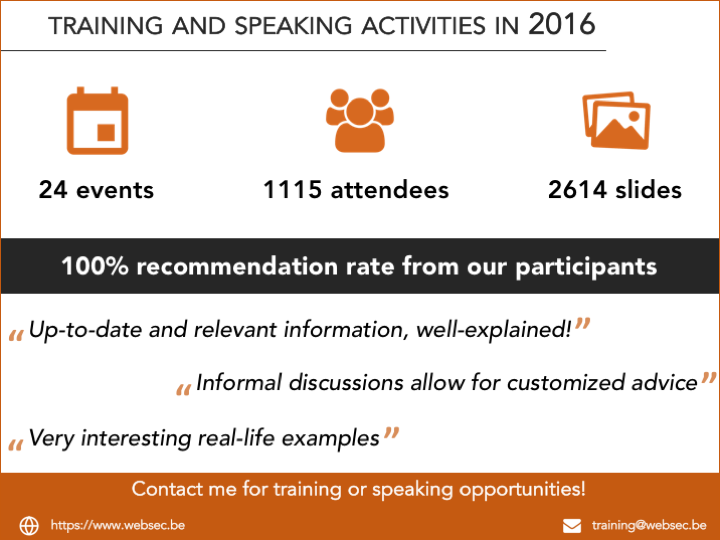 The image below condenses a year of trainings and speaking engagements in a few numbers and quotes. The kinds of events I talk at are a mix between highly customized trainings to small groups of developers, and public speaking engagements to packed conference rooms. Both are a tremendous amount of fun, albeit in totally different ways. I also started DistriNet R&D Bites, an informal series of evening events centered around the research topics of my employer, the imec-DistriNet research group of the University of Leuven. In these events, we bring industry and academia together, to talk about state-of-the-art technologies, both in industry and in research. We started this series in December with an event on Software Defined Networking, and continue in February with an event on the impact of the GDPR, the new privacy regulations of the EU. Apart from that, I’m also working on an online course about web security, which will be released in the second half of 2017. More details on that will follow shortly! As you can see, plenty of exciting things. If you haven’t done so already, make sure you subscribe to the mailing list to stay informed.